Yarn is wound into suitable packages (e.g. cones, chees), mounted onto perforated spindles and then dyeing is carried out by forcing liquor through the package. 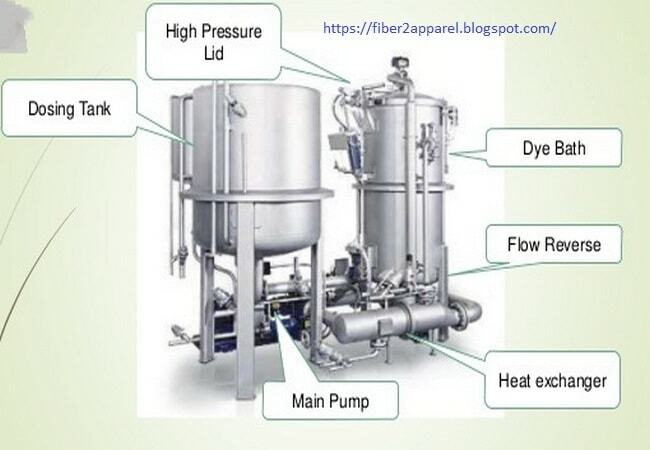 Earlier the machines were known as “pressure dyeing machines”, but the nomenclature is no longer recommended as it leads to confusion with pressurized machines for higher temperature. The first package dyeing machine was patented by otto Obermaier in 1882. The earlier machines were open to atmosphere with unidirectional flow of liquor through the package. Latter better levelness was achieved by enclosing the vessel and by frequently reversing the direction of the flow of liquor. Virtually all modern package-dyeing machines are pressurized and capable of operating at temperature up to 135°C. Hank reeling from ring bobbin is a comparatively expensive process, the plant requires mush space, and the yarn must be wound onto a bobbin, cone, or pirn at a later stage. The second winding from hank after dyeing s also slow and labor-intensive. On the other hand, a single yarn can be wound directly from a cop or ring tube onto a cheese, dyed in this form and then rewound with high-speed machine onto a cone. The spinner, before delivery to the dyer, conveniently cones a doubled yarn. It is more economical for the spinner to cone the yarn than to reel it into hanks. For dyeing, the yarn is to be wound on perforated stainless steel cones or cheese formers. The dyers prefer cheese-form, as they tend to give level dyeing because of their uniform diameter. The success of package dyeing, in terms of both levelness and yarn quality, is greatly influenced by the degree of care taken in the preparation of the yarn packages. A wide range of designs and materials are being used as supporting media for packages perforated cones, springs, rockets, plastic tubes and non-woven fabric centers have all found favor. Adequate stability during handling while putting in and taking out from the machine spindle. All packages must accommodate a small amount of shrinkage in some yarn and the effect of fiber swelling when wetted out. It should withstand the change in temperature of the flowing liquor and pressure during reversal of flow. The wound yarn should not be trapped; otherwise the back-winding off the package will be disturbed. Fairly sufficient resistance to liquor flow at different temperature and pressure-both within and between the packages. High porous area will permit excessive flow causing relative starvation of its neighbors on the same spindle. Package of high resistance to flow will inevitable suffer a shortage of liquor and unevenly dyed. Rectangular dyeing machines originally developed for hank dyeing but further improved to accommodate package frames. These are usually horizontal spindle machines. Peg GSH hank dyeing machine has been improved by fitting it with large pumps to accommodate package. Circular horizontal spindle machines, which are claimed to take 10% higher load. However, such types of machines have little advantage over vertical spindle machines. Horizontal spindle package dyeing machines such as as beam dyeing machines. These side-loading machines are now obsolete. Circular vertical spindle machines, they are probably the most expensive, but also the most versatile types of machines. Learner yarn, but the yarn gives better fabric definition. Faster back-winding and lesser waste. Savings in space, energy, water, chemical etc.